Following a closely-fought one-hour race at the Nürburgring in Germany, Audi claimed both the Blancpain GT Series Sprint Cup drivers’ and team titles, as well as the race win. 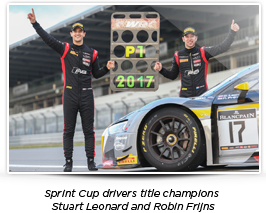 The overall Sprint Cup drivers’ title went to Stuart Leonard and Robin Frijns, who also won the race overall in the #17 Audi R8 LMS. However, it was another Audi of Belgian Audi Club Team WRT that clinched the overall Sprint Cup team title, with Marcel Fassler and Dries Vanthoor finishing the race 10th to secure the teams’ championship: adding up to a highly-successful weekend for the Ingolstadt-based manufacturer. 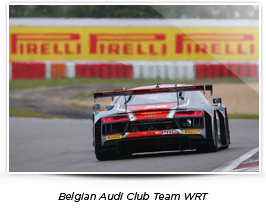 The race winning duo of Leonard and Frijns utilised the P Zero DHD tyre to perfection, timing their pit stop to ensure they gained the maximum advantage and crossing the finish line with a lead of 3.967s over the #2 Audi of Will Stevens and Markus Winkelhock. The race weekend was characterised by cold conditions and track temperatures in the region of 17 degrees centigrade. The final round of the Blancpain GT Series will take place in Barcelona on 1 October as an Endurance Cup race, so there will be more titles up for grabs – including the Endurance Cup winners and overall series winners. Belgian Audi Club Team WRT is in the running for these titles as well, alongside HTP Motorsport, GRT Grasser Racing team and Bentley Team M-Sport. Fact of the day: This is the 11th Blancpain title for Audi, with nine of those on Pirelli tyres. Pirelli has also supplied the R8 road car since it was launched in 2006. The Pirelli P Zero and P Zero Corsa System are homologated for the summer and the Winter Sottozero II for winter. Number of the day: 159.1 kph. The average speed of the winning car over the 5.137 kilometres and 30 laps of the Nürburgring Grand Prix circuit, last used for Germany’s Formula 1 race in 2013.